Normally, I don’t give 5 star reviews, particularly for psychological horror. That looms large in my wheelhouse. I cut my teeth on Poe and Lovecraft, after all. I like my horror creepy, not just slashy. I have to tell you, this…this was creepy. I loved it! Joseph is really having a horrible day. 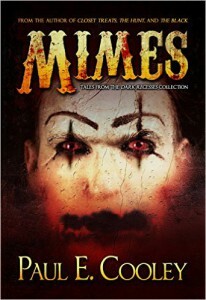 Bad job, bad boss, bad circumstances, and then the mimes. What Paul does with this short tale is immediately grab the reader with a believability that rings true. We’ve all had that job, and we’ve all had that boss. Joseph also behaves exactly like we would, he looks for the nearest exit. He doesn’t run, horror movie style, into the deserted house. Nope, this guy flees to the familiar. And, the bad guys. If you haven’t figured it out from the cover, they’re mimes, but they don’t do the walking against the wind trick. They stand and freak you out. Here’s a great example of Paul’s tension building. Mimes preform, it’s what they do. These mimes don’t perform, and their wrongness grates on the nerves and plucks at the animal brain. Yeah, your gooseflesh will creep. The novelette drops July 17th, 2015. If you’re still on the fence just remember, it’s short so your investment in time and money will be minimal, but the payback will be huge! Buy it, read it, enjoy it!